Who Should Use Grow Tents? Grow tents are designed to keep things simple for hobbyist cannabis growers. 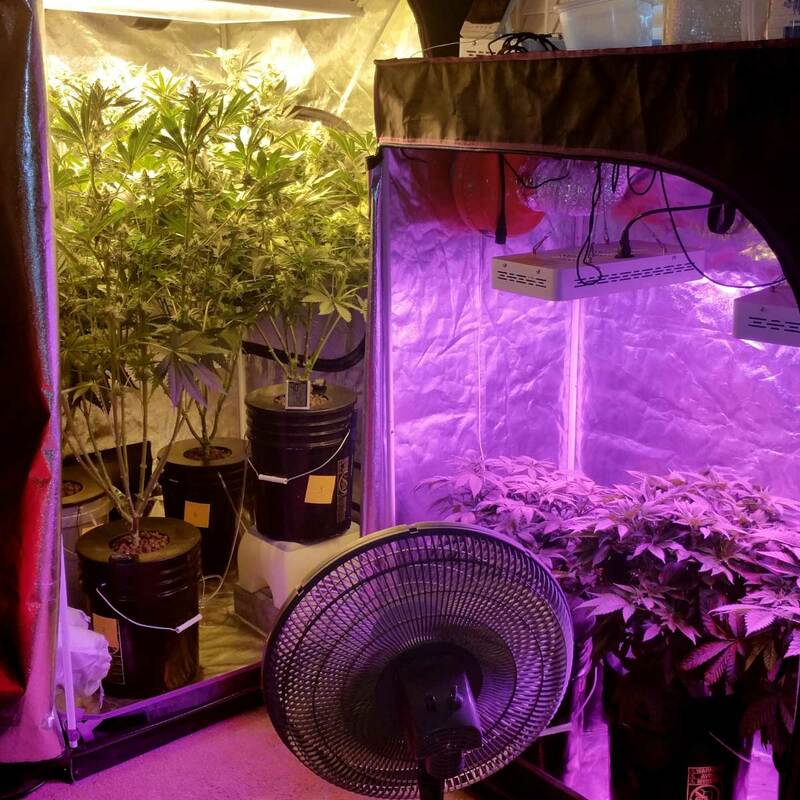 As convenient as grow tents are, they’re not designed for huge marijuana grow operations! But for someone who wants 1-5 ounces/month, a grow tent may be the best way to go! Relatively Cheap – Prices are around $70-150 for your average grow tent. Setting up a grow space to have all the same characteristics (reflective walls, air-tight vents, light proof, a waterproof tray at the bottom to catch spilled water, etc.) can easily cost the same amount or more. Plus it’s difficult to DIY a space so that it works as well as a grow tent (which has been designed for this purpose) and it will often take more time, planning and effort than simply buying a pre-made tent. Easy & Quick to Set Up – Assembling your grow tent and getting completely set up to start growing will take about an afternoon and can be done by just about anyone (full instructions below). Overall, the work of setting up a grow tent reminds me of putting together an old-fashioned camping tent, only weed comes out of it a few months later! Stealth – A grow tent prevents smells and light from escaping the tent when set up properly, and can be tucked away in a big closet or the corner of a room without necessarily drawing a whole lot of attention. Perpetual Harvest – Grow tents work very well if you want to keep two separate grow spaces, for example if you wanted a separate vegetative and flowering chamber for a perpetual harvest. Grow tents create a completely self-enclosed environment that can be managed separately. Helps Prevent Bugs – The intake holes of most grow tents are covered with mesh, which allow air to pass but stops many insects. This helps prevent incidental bugs like spiders or carpenter beetles from getting to your plants. 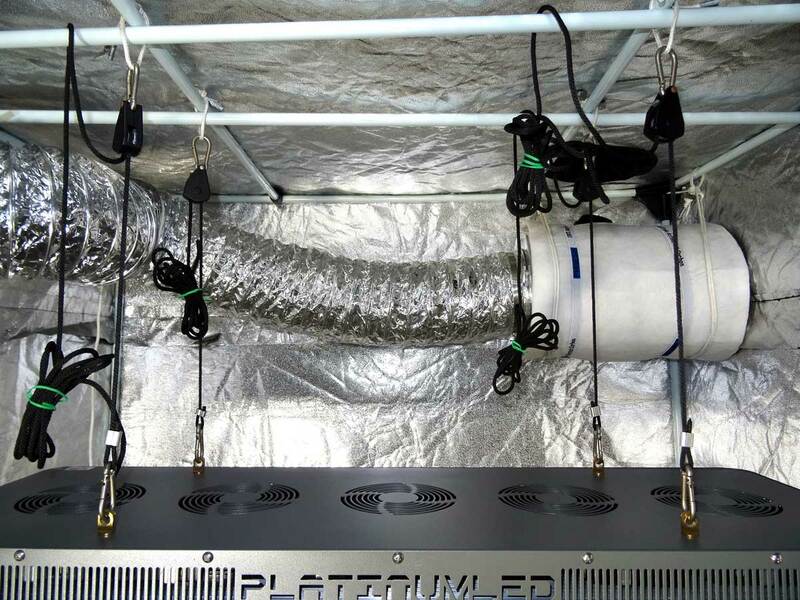 A grow tent with strong grow lights is also a pretty hot and inhospitable environment for many cannabis pests! Keeps Buds Clean – In addition to preventing bugs from getting on your plants, the mesh intake holes help keep out dust and impurities. The sticky trichomes on cannabis buds are surprisingly good at holding on to fibers, animal hair and anything that floats by. A surprising amount of random debris can get onto your buds even if you keep your grow room pristine. A grow tent helps keep buds clean and looking good! Some grow tents don’t look particularly suspicious. 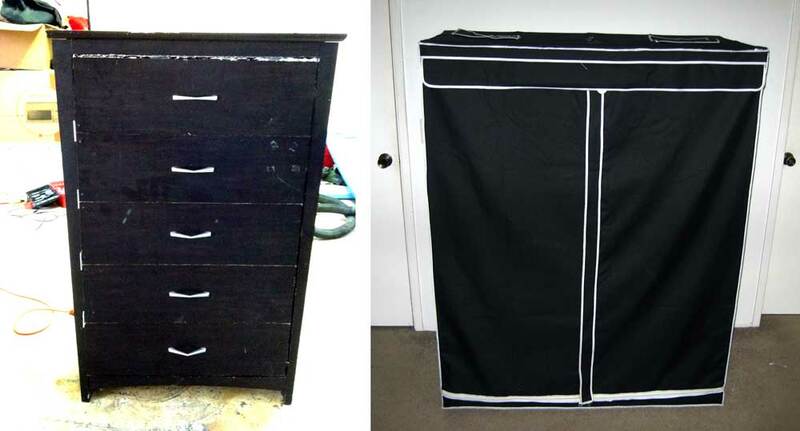 On the left is a homemade stealth grow cabinet and on the right is a 2’x4’x5′ grow tent that looks vaguely like a clothes wardrobe. They’re just about equally nondescript! When all is said and done, a stealth cabinet with fans on the inside (even one done very professionally so it’s completely light proof) is only marginally more stealthy than a black grow tent with a zipper down the middle. 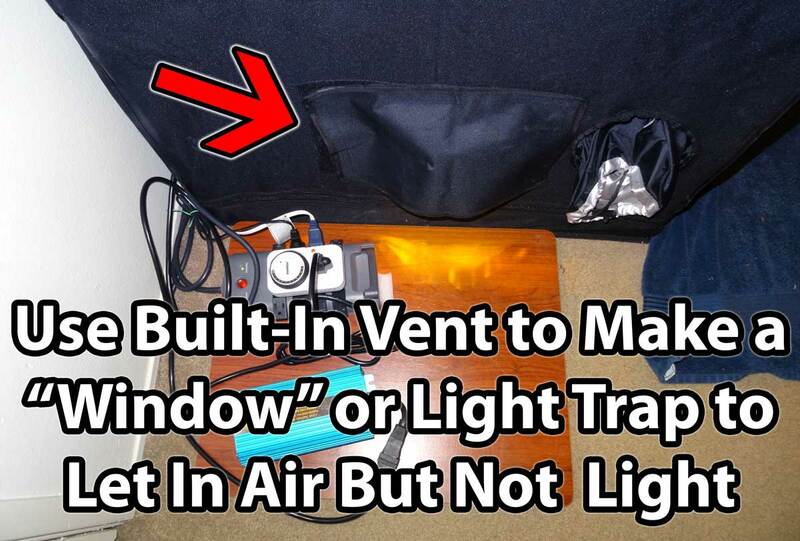 When it comes to stealth, don’t expect any grow tent or cabinet to be stealthy enough for someone to be hanging out in your room without noticing the fact that it’s emitting light/noise/heat. Instead, you’re looking for something that can fool someone who is quickly passing by it for a moment or two. Grow tents also let you easily set up a perpetual harvest. 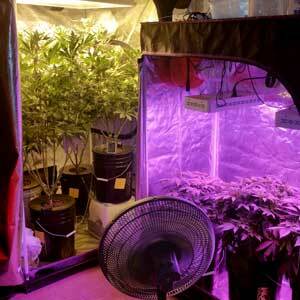 This grower (Manzfoo) keeps young plants in the purple LED tent, and older plants in the yellow HPS tent. As soon as he harvests the big plants, he rotates in the young ones and starts a new batch. This lets him harvest every 2 months or so! If you’ve seen the examples and want to keep it simple and get a grow tent, here’s more information on how they quickly create the perfect environment for your growing marijuana plants! When used correctly, a grow tent lets you recreate nature under its most ideal conditions! Possibly the hardest part of being able to grow cannabis in these ideal conditions is getting set up. However, once everything is set up, it’s mainly a matter of planting a seed and watering your plants until you harvest bud! If you’re trying to create a growing environment from scratch, you may have to do some DIY which can feel overwhelming if you’re just getting a grasp on growing. Utilizing a grow tent takes care of a bunch of environmental factors in one fell swoop. 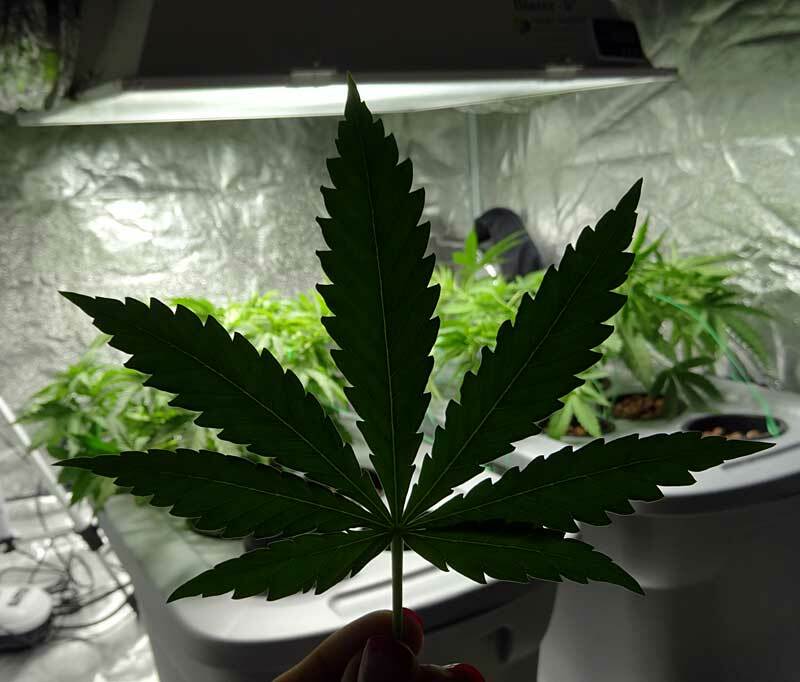 Maximize Your Grow Lights – A grow tent has reflective walls and the reflectivity is equal or often even better than what you could do yourself! Designed for Common Grow Equipment – It’s easy to hang and adjust your grow lights, hook up your fan, find ports and vents, etc. A grow tent accounts for most growing situations. 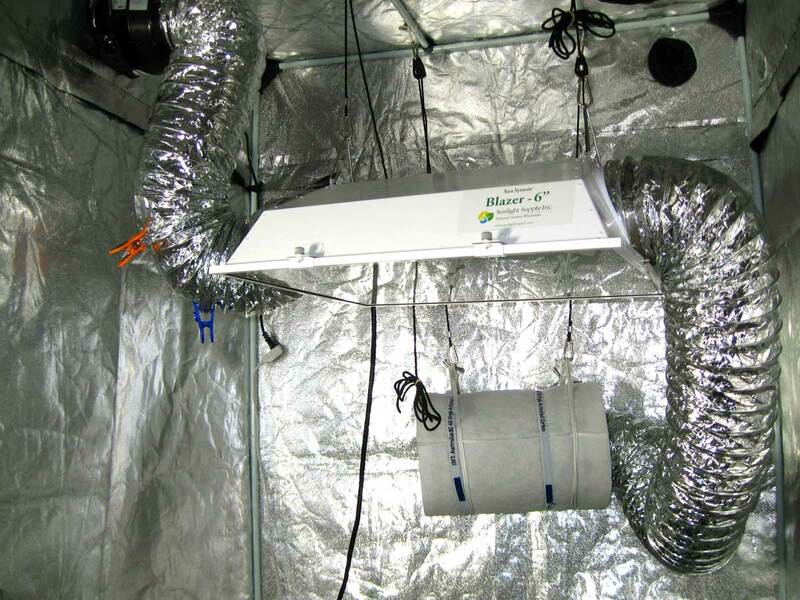 Light Proof – A grow tent is constructed to prevent light from leaking in or out of the tent. Not only does this help your plants (cannabis needs complete darkness at night to make as many buds as possible), it also prevents light from spilling out; you don’t want to possibly alert others that there are some very bright lights inside your home! Sometimes DIY light proofing a space can be tricky, and a grow tent takes that problem out of the equation. Waterproof & Easy to Clean – A grow tent usually has a waterproof floor that contains regular spills so you don’t have to worry about water leaking out onto your floor. It’s also easy to wipe down the walls and floor of a grow tent, making it simple to keep things clean. Designed for Airflow – The sealed nature of the tent combined with vents and air ports make it so you can set up a whirlwind of air in the tent simply by installing a strong exhaust fan in one of the included ports. This constantly pulls fresh air in to circulate through the tent from the intake vents near the floor, replacing all the air in just minutes while giving plants plenty of CO2 and preventing problems from heat buildup. 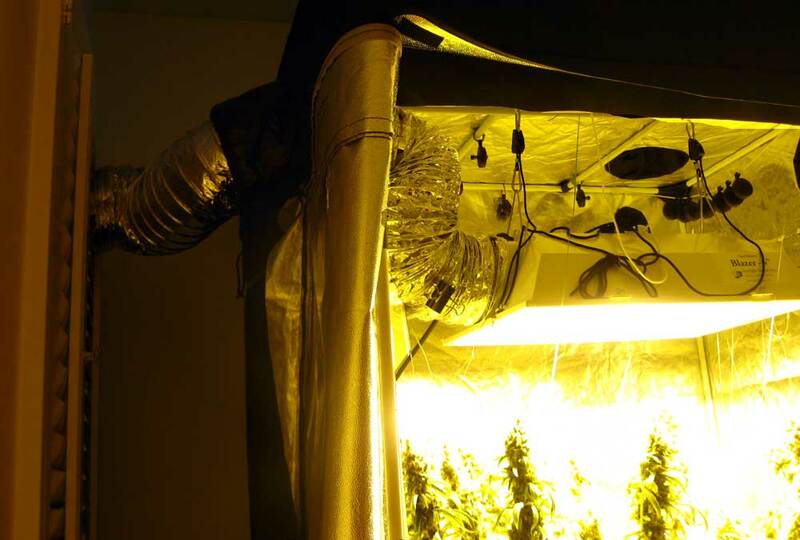 Smell-Proof – Grow tents make it really easy to take advantage of a carbon filter. The negative air pressure caused by the sealed space prevents any smells from leaking into the home as long as the carbon filter is attached, the exhaust fan is on and the doors are kept closed. 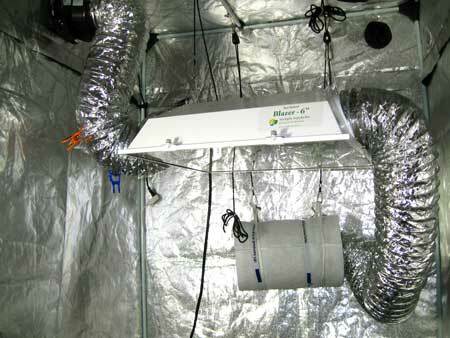 At its simplest, a grow tent just needs an exhaust fan and a grow light. At this point you’ve already created a great cannabis growing environment! See a grow journal in this setup! 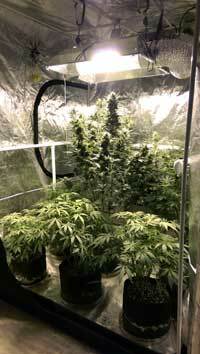 There are hundreds of models of grow tents, and they come in many different sizes. It can be confusing to know which one to get for your situation, and which ones are best overall. This should help clear things up! When it comes to grow tents two of the most common sizes (in the US) for hobbyist growers are the 2’x4′ and 4’x4′ tents. These are also made to fit the most common grow lights. I believe a 2’x4′ is one of the best sizes for new growers because it gives you enough space for decent yields (get up to several ounces a month) but it isn’t big enough to be overwhelming. You get easy access to all the plants, including the ones in the back, but still get all the advantages of a full-size grow light. You can start with a small light like CFLs or a small LED in this size tent, and still have room to eventually upgrade up to a 400W HPS (7-14 oz harvest). For bigger growers, a 4’x4′ grow tent is great because it can be used with the next class of grow lights up to some of the biggest grow lights. 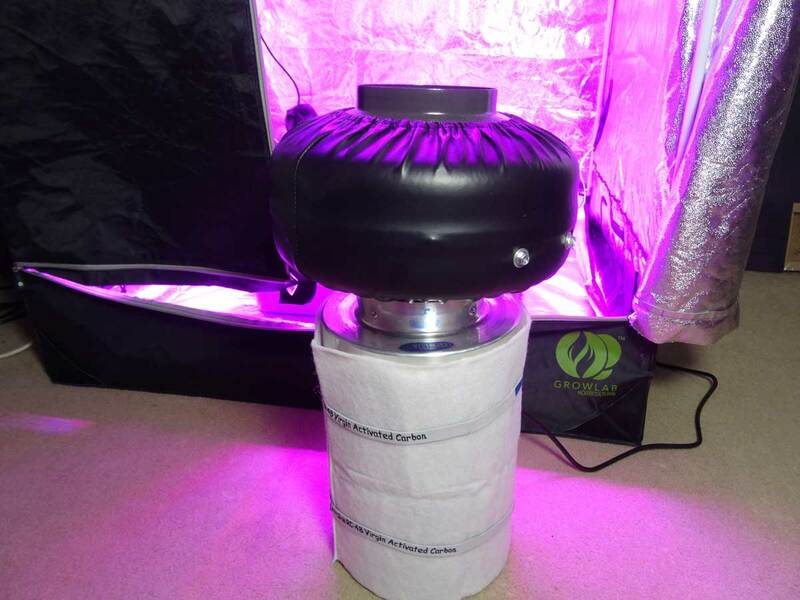 It can support a 600-1000W HPS or LED grow light as long as it’s 6-7′ tall. If you want to double your yield from a 2’x4′ but don’t want to have to set up a whole grow room, a 4’x4′ is the way to go! It’s big enough for monster yields (a pound or more!) but still small enough to be manageable by just one person. Short spaces are difficult to grow in because you have to worry about your plant “growing into” the grow light. A 5′ tall tent will support up to a 400W, though more height makes things a little easier. 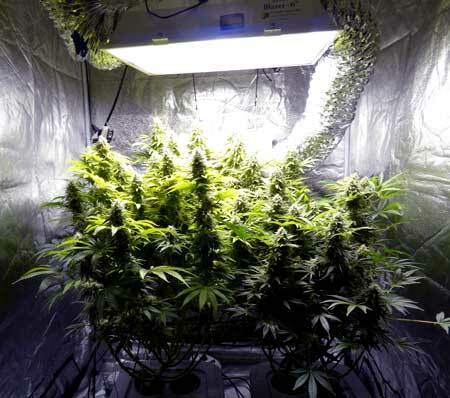 Having an area that is 7′ tall makes it much less likely you’ll ever be limited by the height of your grow space. Even a little extra height can increase your yields in some cases because a taller space lets you support more powerful grow lights and grow larger plants. It can be tempting to try to get a really expensive grow tent with all the “bells and whistles” because you want to give your plants the best possible home! But honestly the cheapest grow tent has 90% of the features of a far more expensive grow tent. If you’ve never grown marijuana before and are reluctant to invest a lot of money, I recommend starting cheap when it comes to tents! 2’x4’x5′ Tent – If possible, I recommend getting a tent that’s 6 or 7 feet tall so you never have to worry about running out of height. This easily supports up to a 400W grow light. However, very tall tents in this size are relatively rare and it’s much more common to see grow tents that are 2’x4’x5′. The shorter versions will also do the trick (and can support up to a 400W light if you have a great exhaust system and use careful plant training). Another advantage is that smaller tents are a little less conspicuous looking and people sometimes mistake them for a cheap Ikea-style clothing wardrobe. 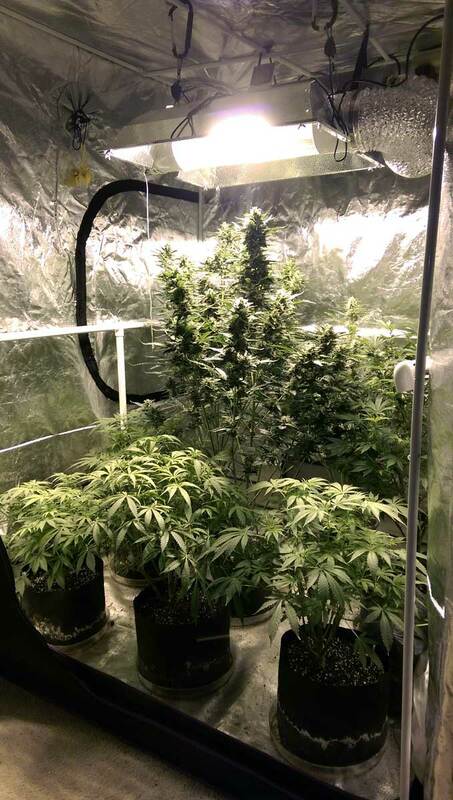 Just remember with a short tent to keep a close eye on plant height to make sure you don’t run out of room as plants get taller. 4’x4’x7′ Tent – This size tent can support even the biggest HID grow light, the 1000W HPS. I personally think it’s the perfect size for a 600W (the most efficient of all grow lights, and it can produce more than a pound), so you get the best and biggest results as possible without dealing with a ridiculous amount of heat or killing your electricity bill. This 4’x4’x7′ grow tent costs a bit more at $110, but has a few extra features and is one of the more popular grow tents in this size. The best way to hang your grow light is using rope ratchets if you can; they are cheap and easy to set up. Rope ratchets make it incredibly simple to adjust your lights at any time without the chance of dropping the light on your plants. Sometimes it’s helpful to be able to quickly put lights up or down, whether you want better access to the back of the tent without the light beaming on your head, or even just to take better pictures of your plants. Make sure whatever you use to secure the lights (rope ratchets!) can handle at least twice te amount of your light just to be safe! Cheap rope ratchets allow you to move a grow light up and down with a few clicks, so you never need to hold up your light or worry you might drop your light on your plants. I think the best way to make an efficient exhaust system is to hang your exhaust fan inside the tent. This significantly muffles the sound of the fan running, and lets you create a relatively straight path from your light to the fan for maximum circulation and airflow. 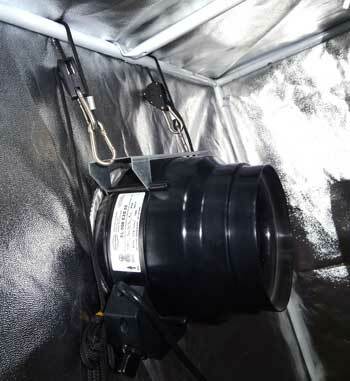 Use strong nylon rope or rope ratchets to hang your exhaust fan inside the grow tent (from the top bars) to dramatically reduce sound and vibration. Your fan will sound a lot louder if you just set it on top or on the outside of your tent! If you’re using a grow light that has an air-cooled hood that contains all the heat, like many MH or HPS grow lights, you can connect the exhaust fan to the hood directly for ultra efficient cooling. 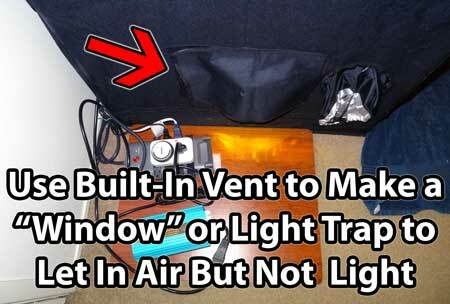 This lets you vent hot air directly out a window so heat is never beaming down onto your plants. For the best results, make sure there is a way for fresh air to get in. Grow tents almost always have removable vents near the bottom of the tent to let in fresh air. Some growers remove the covers completely, but that increases the chance the light will leak into the tent. Although some grower don’t use a carbon filter, they can unintentionally be making a trail that leads straight to their grow. Carbon filters ensure there are no smells whatsoever getting where they aren’t supposed to be in addition to providing peace of mind! Just like the exhaust fan, I recommend hanging your carbon filter with rope ratchets because a carbon filter is surprisingly heavy and rope ratchets make it a lot easier to make adjustments! It’s important that there is an air-tight line from the carbon filter to the fan (without any air leaks) in order to prevent smells from escaping the tent! Growers often hang a carbon filter in the back of the tent so it’s less in the way. 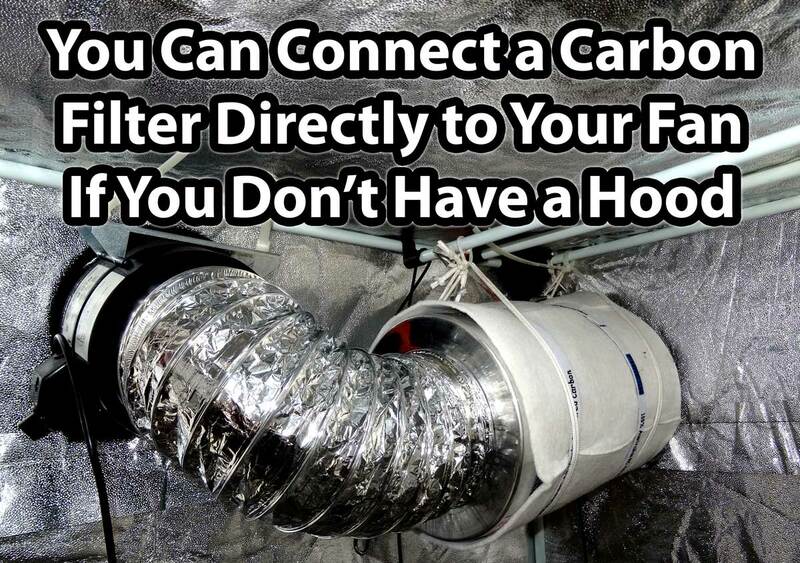 Or if you have an air-cooled hood you connect the carbon filter > light > exhaust fan. This is considered a “complete” exhaust system because it cools the grow light and scrubs all smells in one fell swoop. No matter how you end up doing it, the main idea is to ensure any air leaving the tent must first pass through this carbon filter. As long as you keep the tent closed and the fan on, you should never be able to smell cannabis in your home or outside. The negative air pressure caused by the sealed tent prevents any air inside the tent from leaking out. Note: When you open the door of the tent it breaks this seal, which means smells may flood out the door or get pulled into the exhaust fan prematurely. To deal with smells when you open the tent, you can use a product called ONA gel, which is surprisingly effective at covering up odors on a short-term basis. Also, here’s a trick I learned from a dispensary owner: set up a carbon filter with a fan attached inside the room itself (in addition to the one in your tent), and run it alongside some ONA gel whenever you need to make sure all smells are gone quickly in the room, even if you’ve opened the tent. It works to keep a dispensary smelling neutral and it works just as well in the home! If you have a smell emergency, you can use an exhaust fan directly attached to a carbon filter sitting on the floor. This isn’t as effective as a “real” exhaust system, but it will clear an entire room of smells in just minutes. Some growers who can’t fit a carbon filter in their grow space have even used this technique to control smells for a whole grow! You’re at the home stretch! Your grow tent should already be set up, and now it’s just a matter of double-checking everything and adding your plants! You can dramatically reduce the sound of fans by hanging them as opposed to letting them sit on something. Keeping fans clean will also make them as efficient as possible while preventing sounds from developing. For both air and water pumps, it makes a difference to place them on something besides directly on the ground. For example placing them on a piece of wood will muffle the vibration. You want to make sure no light or smells will make it outside the tent! 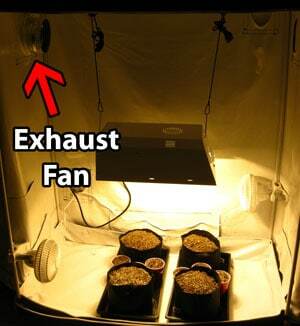 After everything is set up, turn on your grow light and exhaust fan for a day to test out your new space. The sides of the tent should bow inward slightly when you turn on the fan. Inward bowing means you have created negative air pressure, which is perfect because it will prevent smells from leaking into the home as long as the tent is kept closed. Ensure that your carbon filter is securely attached to your exhaust fan, with no way for air to leak in or out. A strong seal between the carbon filter and the fan will ensure that any air leaving the tent passes through the carbon filter first, which will completely scrub it of any smells. Take a minute to check around your house to see if you can hear anything that seems odd when your equipment is on. 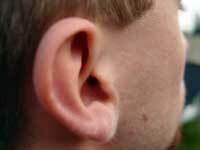 A constant hum or rattle can be suspicious, so listen carefully. Go outside and walk around your house once in the morning, once in the afternoon, and once at night to see if there’s any noticeable sounds or if you can see suspicous looking light from outside. Lastly, take a good look around inside the tent. Everything should be secure. Make sure that any electronics are off the ground (power strips, ballasts, wires) just in case there’s ever a water spill. Learn more about electrical safety! Get Started Growing! You Are Ready! When plants are about 6 weeks old, put your grow lights on a timer so they turn off for 12 hours each day. 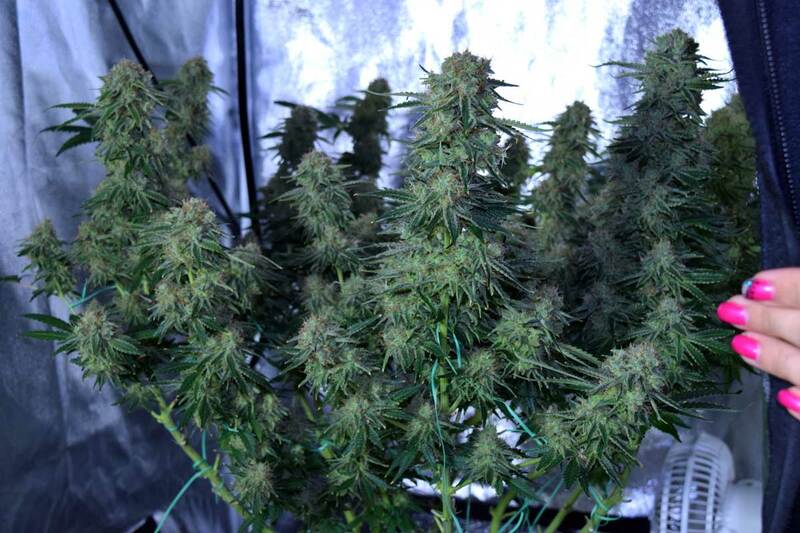 Buds will start growing in 1-2 weeks. Harvest sweet, sweet buds a few months later! 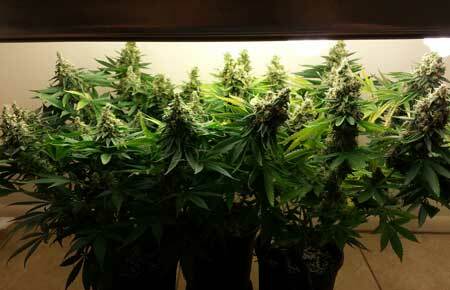 Get step-by-step instructions for the rest of your grow or read the complete beginner’s guide!